The Monti government is now officially in charge. 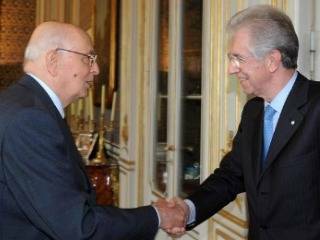 After swearing in the President of the Republic Giorgio Napolitano in the Quirinale Palace, Monti went to Palazzo Chigi to meet former Prime Minister Silvio Berlusconi for the official handover. 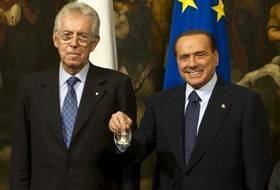 Monti’s team counts no politicians, and the number of ministers has been reduced from 23 to 17. The average age of the government has been raised from 55 of the resigning one to 63. The ministers, all coming from the world of academia, civil service and banking, are renowned professionals in their respective sectors. Three of the appointed ministers are women. They will cover key functions such as Interior, Labor and Welfare and, for the first time in Italian history, Justice. 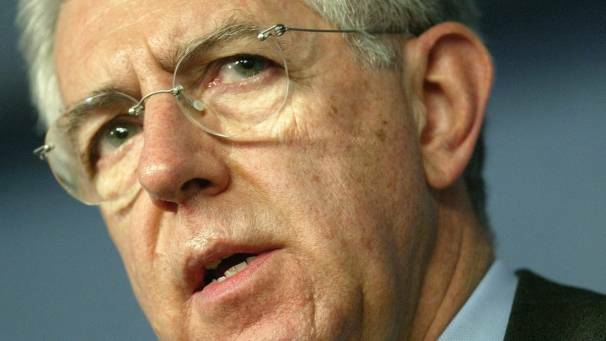 Former European Union Competition Commissioner Monti will also be the interim Minister of Economy, personally assuming the responsibility of intermediating with the European institutions, who are observing the transition to the new technocratic government with close attention. The appointed ministers have all been chosen according to a stringent criteria of professional excellence for their executive duties. Economic Development, Infrastructure and Transportation have been assigned to Corrado Passera, 56 years old, and a graduate of Bocconi University like Mario Monti. Passera is an experienced manager who has had executive positions in some of the most important Italian corporations (Mondadori, Cir, Gruppo Editoriale L’Espresso), he has been the chief executive of Banco Ambrosiano Veneto, and of Poste Italiane, Italy’s postal service. Since 2002 Passera has been the chief executive of Italy’s largest retail bank, Banca Intesa San Paolo. Defense has been assigned to Admiral Giampaolo Di Paola, 67 years old, who was the President of NATO’s Military Committee since 2008. He got the news of his appointment during an official visit to Kabul, Afghanistan. Earlier in his career, Di Paola has also been Chief of Defense staff, Defense Secretary General and National Director of Armaments. Anna Maria Cancellieri is the Minister of the Interior. She is 67 years old and is a graduate in Political Science. She is the second woman in the history of Italy to be appointed to the Ministry of the Interior after Rosa Russo Iervolino in 1998. Cancellieri has been a Prefect in Genoa, Vicenza, Brescia, Bergamo and Catania, and a month ago she was appointed Commissioner for the Municipality of Parma, with the duty of reining in the financial dislocation of the council in charge. Giulio Terzi di Sant’Agata, former Ambassador of Italy to the United States, is the new Minister of Foreign Affairs. Terzi is 65 years old. He has been the Chief of the Italian delegation to the United Nations Security Council from August 2008 to September 2009. In 2002 he was the Ambassador of Italy to Israel, a role he kept until 2004. He has also served in the Ministry of Foreign Affairs in Rome as Vice Secretary General, being very active in the fields of multilateral security, human rights and relations with international bodies such as the European Council, the NATO, the UN and the G8. Elsa Fornero, the new Minister of Labor and Welfare, Social Policy and Equal Opportunities, is a professor of Political Economics at the University of Turin. She is Vice President of the Surveillance Council of Banca Intesa San Paolo and a professor in the Ph.D. program in Economics at the University of Turin. She also teaches at the University of Maastricht. Her first challenge as a Minister is to reform pensions. Francesco Profumo, former President of the National Council of Research (CNR), is the new Minister of Education. He is an engineer and a professor of Machines and Electrical Activation at the University of Bologna. He was formerly a member of the administrative board of Unicredit Private Bank, Il Sole 24 Ore, Fidia Spa, Telecom and Pirelli. Since 2005 he has been the Dean of the Politecnico di Milano. Lorenzo Ornaghi is the new Minister of Cultural Heritage. He received the news of his appointment while teaching his Political Science class at Università Cattolica in Milan, where he has been Dean since 2002. A student in his class tweeted the farewell words of the professor, who said he was sorry to interrupt the lesson, and that his was not a goodbye but a temporary parting. Since 1998 Ornaghi was a member of the administrative board of the newspaper Avvenire. He is also the Editor-in-Chief of the scientific magazine Vita e Pensiero, and he is a member of the scientific committees of several other academic publications. Mario Catania is the new Minister for Agricultural and Forest Policies. He previously held the position of Chief of the Department for Agricultural and Forest Policies of the Ministry that he is now in charge of, and he has been a member of the Italian Permanent Delegation to the EU in Brussels. Paola Severino is the appointed Minister of Justice. She is the first woman in the history of the Italian Republic to be assigned such a role. Severino is a renowned lawyer who has defended, among others, former Prime Minister Romano Prodi. She also defended Cesare Geronzi and Francesco Caltagirone in the Cirio trial, and the Union of the Jewish Communities against former SS officer Erich Priebke. Severino is the Vice Dean of LUISS Guido Carli University in Rome, where she has been a professor since 1987. From 1997 to 2001 Severino has been the Vice President of the Council of Military Bench. She also worked in the staff of Giovanni Maria Flick, former President of the Italian Constitutional Court. The Undersecretary to the Presidency of the Council is Antonio Catricalà, former President of the Italian Antitrust Authority. He is a professor of Consumer’s Rights Defense at LUISS Guido Carli University, and he has taught Private Law in the Law faculty of Tor Vergata University in Rome. Corrado Clini is the new Minister of Environment. He has worked in the Ministry of Environment since 1990 and he was in charge of the Division for Sustainable Development, Climate Issues and Energy. He is a Senior Researcher at Harvard University and he is a member of the scientific committees of several publications. He has represented Italy in several international conferences on climate and energy: in 1995 he has coordinated the management of the second meeting of the Intergovernmental Panel on Climate Change, whose works led to the ratification of the Kyoto Protocol. He is 64 years old. Renato Balduzzi is the new Minister of Health. He is a professor at the University of Western Piedmont and at Cattolica University in Milan. From 1989 to 1992 he has been Counselor of the Ministers of the Defense, and from 1996 to 2000 he has also worked with former Minister of Health Rosy Bindi as the President of the Ministerial Commission for the healthcare reform. He is the President of AGENAS, agency responsible of healthcare services for the Italian Regions. Enzo Moavero Milanesi is the new Minister of European Affairs. He is a lawyer and he collaborated with Mario Monti in Brussels for nine years since 1995. He is currently a judge in the European Court of Justice in Luxemburg. In 2002 he was nominated Adjunct Secretary General of the European Commission. The new Minister of International Cooperation and Integration is Andrea Riccardi. Riccardi is the founder and leader of the Community of Sant’Egidio, a catholic movement promoting peace and intercultural dialogue. He is a renowned historian and a professor of Contemporary History at Roma Tre University. In 2003, Time Magazine listed Riccardi in its chart of the Top 36 Modern European Heroes. Piero Gnudi is the appointed Minister of Tourism and Sports. He is a member of the Administrative Board of Unicredit and he is a member of the Executive Committees of Assonime, Aspen Institute, and the Council for the Relations between Italy and the United States. Previously, he has been the President of Rai Holding, IRI, ENEL, Locat and Astaldi. The new Minister of Territorial Cohesion is Fabrizio Barca. Currently the head of the Department of Development Policies in the Ministry of Economy, Barca has been a professor in several Italian universities (University of Siena, Bocconi, Tor Vergata in Rome, University of Urbino, University of Modena). In 1999 he was the president of the Territorial Policies Committee of the OECD, and he has previously worked at Banca D’Italia as territorial director. Piero Giarda is the new Minister of Parliamentary Relations. He is an Economics graduate with an international academic curriculum: from 1965 to 1969 he was a student at Harvard and Princeton University. In 1970 he was a Visiting Professor at Harvard University. He is in charge of the Laboratory of Monetary Analysis at Università Cattolica in Milan. He has been a consultant to the Presidency of the Council and to the Ministry of Finance, and from 1995 to 2001 he was State Undersecretary to the Ministry of Treasury. Giarda is also the Vice President of the Fondazione Milano per la Scala.